Broken Hill museum volunteers meet in the research room at the rear of the Synagogue of the Outback with Kate to make forward work plans for the year ahead. What region are you currently working as a Museum Advisor? My work as a Museum Advisor currently takes me to Broken Hill. It is a place widely known for its desert landscape, being the Country of the Barkindji, and its mining and labour history. This is a new role for me and what I especially appreciate about the opportunity to visit and work with the collections and museums at Broken Hill is the uniqueness of the region, and of course the people who care for its collections. What have been your first impressions of Broken Hill’s museums and collections? 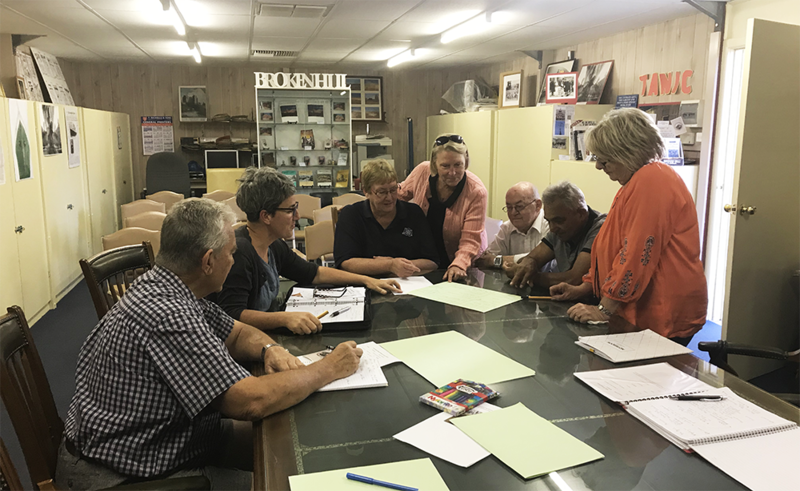 Broken Hill, like any place has its own particular stories and characters, despite its museums and collections reflecting similar historic themes to those of other regional areas. However, the differences most influenced my first impressions. Its remote and harsh, yet stunning and colourful landscape links into every facet of its history. The town’s long and widely-influential mining and labour history is most apparent – both in the landscape and the dominant history told. Just below the surface, however, is a trove of other stories; and this complex of stories is apparent in the region’s network of museums and large collections, reflecting the diverse peoples and communities that were born or established here overtime. I have been forewarned that the peculiar nature of Broken Hill can snare and drag you in. Despite just starting at Broken Hill, what is the most interesting object you’ve come across? For me most historic objects are interesting so I wouldn’t like to suggest a single object as being the most interesting. Granted that many objects are interesting purely based on their aesthetic and material characteristics, I think it is fair to say that most museum practitioners hold that the story or stories that objects reflect, or embody, adds considerably to their appeal. Among the many objects that have caught my eye and piqued my interest are the wooden nose pegs exhibited at the Broken Hill Mosque Museum. These are simple hand-modelled objects, used by the town’s Afghan cameleers. Inserted into the pierced nose of each camel, a rope was then attached to the peg to ‘string’ or group them together in a line, readying them for travel. The nose pegs are fascinating objects to me given their simplicity, are hand hewn and worn in appearance. As well, the pegs performed a small yet important function in the transport of every-day and trade-goods throughout the wider-region until motorised transport took hold. The pegs also underscore the social history of the Afghan cameleers at Broken Hill.